The Night Eagle Cafe will present Steve Gillette and Cindy Mangsen. Performing on guitars, concertina, banjo, and fiddle, Steve and Cindy combine dynamic harmonies, beautiful songs, and instrumental virtuosity to captivate audiences of all ages. Steve Gillette's musical style reflects his roots in traditional music and the singer/songwriter movement of the mid-sixties. He plays guitar with a unique style using flat-pick and two fingers with a virtuosity that has been compared to Doc Watson. Steve is best known, however, as a superb songwriter. His songs have been recorded by dozens of major artists including Garth Brooks, John Denver, Waylon Jennings, Anne Murray, Tony Rice, Jerry Jeff Walker, Linda Ronstadt, and Tammy Wynette. "Darcy Farrow" was the first song to be covered, and in 1966 Ian & Sylvia made it their own. Twelve world-class performers later, the song is still a folk-music standard. So, too, is "Bed of Roses," which has been sung by everyone from Bobby Vinton to The Oak Ridge Boys. Equally notable are Steve's film credits for MGM and Disney, including songs written for the Disney characters Jiminy Cricket, Dumbo, and Winnie-the- Pooh. Steve has performed on over 100 college campuses and at most of the major music festivals. His recent solo album, The Ways of the World, was recorded in Nashville and produced by Jim Rooney. He is also the author of the book Songwriting and the Creative Process, published by Sing Out Press. "Use what you learn from this great book," writes Judy Collins, "you will get better as a songwriter: you can't fail." Cindy Mangsen has long been a favorite of fans who favor traditional material, although her repertoire includes both songs by contemporary writers and original material. Cindy plays multiple instruments, and is renowned for her compelling voice which is said to "warm a New England winter." Her latest solo album, Songlines, was chosen as one of the top ten folk albums of 1993 by the Boston Globe. She is also well-known as a member of a trio with Priscilla Herdman and Anne Hills, as heard on their Flying Fish recording Voices and their recent Gadfly release Voices of Winter. Like Steve, Cindy has been featured at many folk festivals and has appeared on NPR's All Things Considered and Mountain Stage. Together since 1989, this husband and wife team "express a deep affection for traditional and contemporary folk music...Whether the song be a 500 year old ballad, an early blues, or an original composition, Gillette and Mangsen combine respect and intuition for a captivating performance" (Sing Out! Magazine). Canadian River Music adds, "What more perfect combination than these two superb artists. Their voices weave together perfectly, each enhancing the other." Steve and Cindy have delighted audiences across the United States and Europe with their wonderful music, quick humor, and warm presence. The have recorded two duet albums: Live in Concert captures their stage magic, while The Light of Day was named Best Folk Album of 1996 by WFMT, Chicago, and WDET, Detroit. 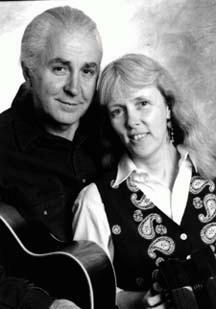 "No matter what kind of folk music you like, you will probably love Steve and Cindy. Don't miss this concert" (Princeton Folk Music Society).